Have you thought about table decorations yet? Do you have the rehearsal dinner booked? Are there certain photos you want taken? Do you have a theme for the wedding? Planning a wedding leaves little time to live in the present. Questions come flying from family members and friends. Everyone is curious, everyone wants to help. No, we stammer. We haven’t thought about that! No, we groan. We haven’t gotten to that yet! While details get set and plans whirl into motion, we try to live in our current state — engaged life — outside of planning. As much as we look forward to getting married in June and appreciate mapping out our wedding day, we treasure this time of being engaged and realize that God has given us this period to prepare for more than just a single day, but for a lifetime vocation. “One day at a time” has been a theme throughout our relationship from the beginning. 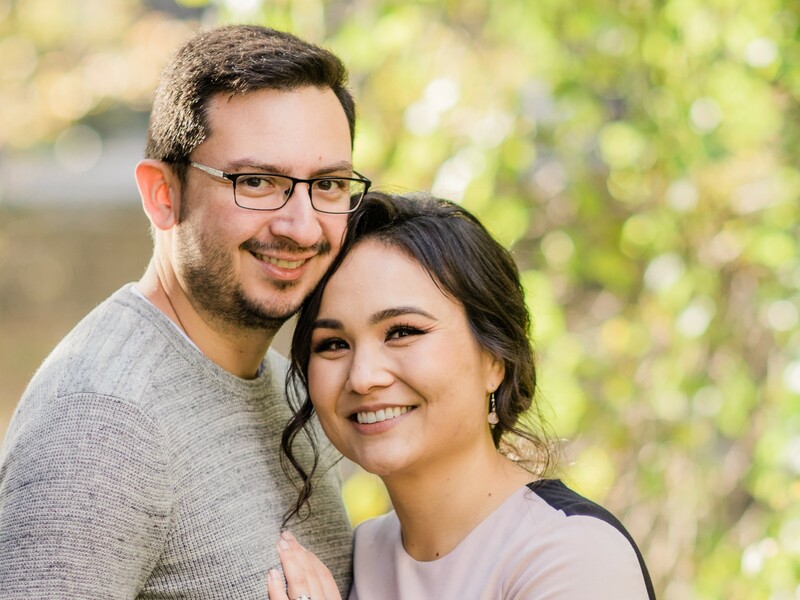 We met through a dating app called Coffee Meets Bagel and were essentially strangers at our first date, although the app’s algorithm connected us through mutual friends on Facebook. Ahead of the date, we tried to squelch our nerves. What would a graduate student of moral theology (Anna) and a biomedical engineer (Walter) have in common? What would we talk about? Was this going to be awkward? Probably. We would just have to go with it. Turns out, conversation came easily and one date led to a second, and third, and another. Over the next couple of months, we slowly got to know each other. Anna wondered “how Catholic” Walter was, and if Walter would think she was “too” religious. Walter pondered if our personalities and careers (What did theology majors do exactly?) were compatible. When we finally became official, we discussed what we thought the purpose of dating was: to help make one another the best versions of ourselves, and to do that, we wanted God to be a part of our relationship. As time passed, we found ways to grow spiritually as a couple. On the phone at night we would read the day’s Gospel together and reflect on the passage before hanging up. We would go to Mass together and began reading spiritual books together. We would discuss what Anna had learned in her theology courses that week. Walter would provide much needed moral support when Anna was exhausted from rambunctious seventh graders in her religious education class at her parish. Six months into the relationship, Anna got a job offer from Catholic News Service, which meant relocating four hours away from New Jersey to Washington, D.C. What had been a see-you-every-weekend relationship suddenly became a see-you-every-two-maybe-three weekends. “One day at a time” took on new meaning. Our efforts to take the relationship slowly and live in the present started battling with the desire to constantly look ahead — to the next weekend one of us would be traveling to visit. Dating long distance was challenging, but it opened opportunities for growth. The spiritual foundation we had begun to lay in New Jersey helped as we moved into a new chapter. Distance provided space for us to lean in to God, to our families and friends. It put the relationship into perspective: Did we want to continue to date? Did we really think we had a future? And where was God in all this? Where was he leading us? Taking each day as it came meant that we had to trust God. He had led us to each other (yes, through an app’s algorithm!) and would reveal his plan for us in time. Now as an engaged couple we see our mantra, “one day at a time,” as a practice of trust and a way each day to prepare for married life. Only God knows his plans for us, but we trust that He will give us the grace to strengthen our bond now, and even more so in the sacrament of marriage.